“Rinngg” the school went. School was finish for the day but guess what? After school at 6:00pm there is going to be ....... A MUSICAL EVENING! I was so excited! I went home and got ready. At 5:30pm there was a Sausage Sizzle before the actual event. I went to school and I rushed into the classroom so I could get my skirt from Mrs Moodley. When I walked into class everybody looked elegant and sophisticated. Everybody was wearing black and white. 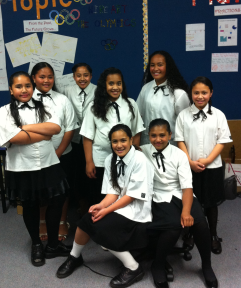 Girls wore long black skirt and the white school blouse. The boys wore black long pants, long white sleeved shirts and a waist coat plus a bowtie. We took some photos before we went to the hall. After taking photos we all lined up in our classes then we all walked into the hall in excitement. When we walked in the hall I saw families, parents and my family too. Everybody was finally settled so we could get started. Lavinia started us off with a prayer. Class after class after class came up and performed. I really enjoyed watching the classes perform. Room 3 sand Puppet on a String and Somewhere out There. .
First they sand Puppet on a String. They looked so bright with their colourful T-Shirts. Next they sang Somewhere out There. The soloists were Ana and Rachel, they sang beautifully. Next it was our classes turn to perform. I walked with excitement to my instrument. I was play the Mini Marimba. We were playing a Medley. I enjoyed playing in front of everyone. To entertain people Leone jumped around and clapped his hands. The Crowd went Wild. My favourite item was the Noizy Boyz. It was a group of boys playing drums. It was superb! The crowd was just screaming at the top of their lungs. The final act was A’leina singing but everybody sang along too. It was great to see everyone having fun. Everybody was laughing. We weren’t quite finished for the night. We had to say goodbye to a very special person.... Mrs Koloti as it was her last week with us. She was going to have a baby girl. FAREWELL MRS KOLOTI! She sat in a chair while the Year 8 girls sang a Farewell song to her. Then the night was over. Everyone rushed out of the hall and it was dark. It was great for everyone to share their talents. I hope that we do this again. Wow, I am Amazed that I look at your Blog,Salome I really like how you write stories on your blog, KEEP THE GOOD WORK SALOME!! Hi Salome,WOW what a great story I love how you started off with amazing word. I loved how you have said that you walked into the hall in a excitement. Next time when you post something on your blog please read your story first before you post it to your blog. Thank you for feedback girls I hope you right amazing stories too.